Gratiot Conservation District: Funding Available in the Bad River Watershed! 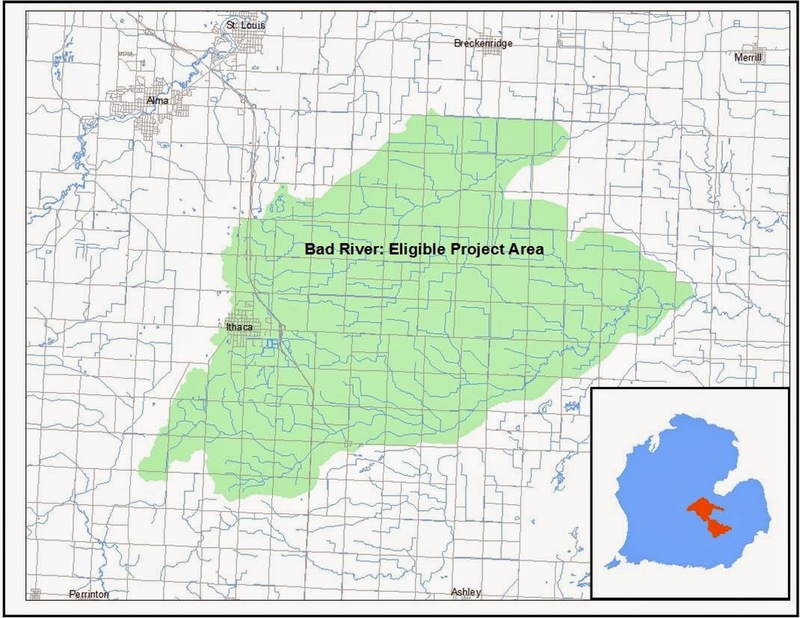 Funding Available in the Bad River Watershed! The Gratiot Conservation District is pleased to announce a new soil saving incentive program in the Upper Bad River Watershed aimed at paying landowners to adopt conservation practices on high-risk fields with the intention of reducing the amount of sediment delivered to streams. This pilot program will utilize a new online watershed management tool called the Great Lakes Watershed Management System developed by The Nature Conservancy (TNC) in partnership with Purdue University and the MSU-Institute of Water Research. The tool assesses how much sediment can be saved from entering streams by applying different Best Management Practices (BMPs) on the land and paying participants based on their actual sediment reduction performance rather than a set flat rate. This pay-for-performance approach is the first of its kind in the Saginaw Bay Watershed and could be used as an example for future projects in other watersheds. The funding for this project has been provided by a grant from the Great Lakes Commission (GLC) and will provide $118 thousand for contract payments to Gratiot County landowners who live in the Bad River Watershed. Participants will be compensated at a rate of $78.25 for every ton of sediment they prevent. The goal is that these incentive dollars will translate into 7,900 tons of sediment load reduction to the Saginaw Bay Watershed. 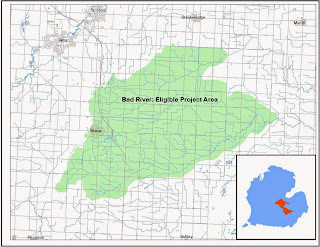 The Upper Bad River Watershed was selected for this pilot project because of its excessive sediment and nutrient load contributions to the Shiawassee River. Past Department of Natural Resources and TNC surveys of the Bad River have indicated poor water quality caused by sediment and a fish community of very low health. The BMPs encouraged through the sediment reduction project are non-permanent, vegetative and residue management practices including cover crops, filter strips, grassed water ways, hayland plantings and reduced tillage practices. GCD hopes the program will find traction with those producers "on the fence" about conservation BMPs because the contracts are short term and the vegetative practices can be harvested for livestock or sold for income. The Saginaw Bay Watershed is the largest watershed in Michigan. Its overall land use is 45 percent agricultural, while the land use within the Bad River Watershed is 86.5 percent agricultural. For more information on the Upper Bad River Watershed Sediment Reduction Project contact GCD at (989) 875-3900 extension 180 or email GCD Watershed Technician Ben Wickerham at ben.wickerham@macd.org. Welcome Ben Wickerham, Watershed Coordinator/Technician! Ben has served as Regional Representative to Pheasants Forever, the Envirothon Coordinator for Mich. Assoc. of Cons. Districts (MACD), as Administrator/Education Coordinator at the Genesee CD, as Stream Profiling Coordinator for the Flint River Watershed Coalition, as a Watershed Coordinator for the Branch CD, as surveyor with the Michigan Natural Features Inventory and habitat maintenance & restoration projects with the DNR. 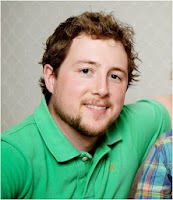 Ben has a Bachelor’s in Zoology/Environmental Biology from Michigan State University. We have three kinds of Plantskyd deer repellent available to purchase from the Gratiot Conservation District. Check out our Tree Sale page for more information. For information about scheduling rental of one of our No-till Drills, see our Resources page. Click here to read more about the Gratiot Conservation District. Our regularly scheduled Board of Directors meetings are held at the USDA Service Center at 301 S. Commerce Drive in Ithaca on the third Wednesday of each month at 8:00 a.m.
Click here for a complete list of meeting dates. Got Wind? Gratiot County Does! Local Second Graders Are Preparing for Their Free Tree! Welcome Ben Wickerham to Our Conservation Team! Congratulations to Monique on Her DNR-funded Habitat Restoration Project! Welcome Lindsey Martin - New MAEAP Technician!